Baroness X is obviously one of my favorites these days. She has such a clever eye for combining colors and finishes. When she creates a shimmering quartet, she generally goes all out. When I heard that she was making a sequel to her Dreamscape collection (which will be coming to the blog in January), I was definitely clamoring to get in line to check out Part II. 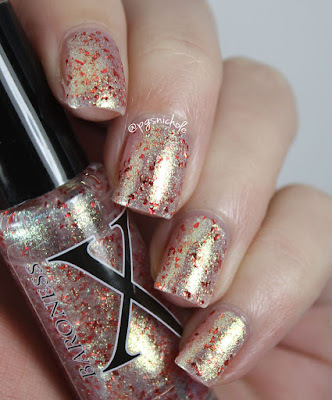 Dynastic is a shimmering explosion of large red flakes and gold shifty micro-flakes. Fanciest fancy thing ever. Red and gold just feel luxe together. The polish finishes completely level and smooth, which is important to note with larger flakes like these. I used three thin coats without a base here. They are never completely opaque, but there is so much shiny going on that you will never see the nail line in real life. Etheric is a whirlwind of purple largeflakes and shifting cool-toned micro-flakes. This one finishes smooth and glossy, even without topper. I used three thin coats + Seche Vite for these pictures, and I was the happiest girl. Phantasmic is a spearminty looking combination of large green flakes and aqua micro-flakes. I feel like this is the most wintry of all the shades, and I so expected it to smell like spearmint. Does anyone else do that? See a particular color and fully expect it to smell a certain way? No? Just me...ok. I used three coats + SV and this was smooth and glassy. 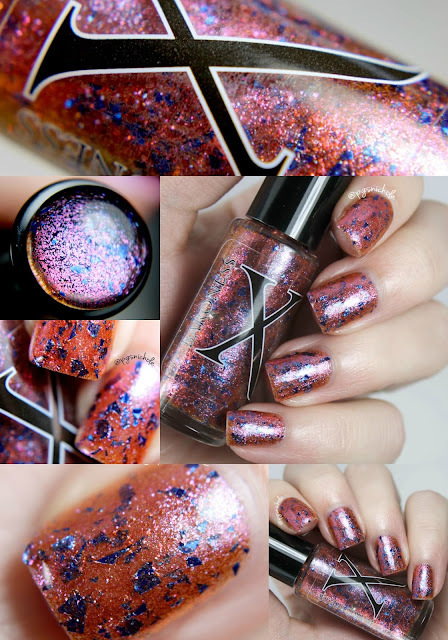 Surrealistic is a firey pairing of large cobalt flakes and tiny fire-peach shifting flakes. This was the most opaque of the quartet, though I still used three coats. It lays smooth and even, and I finished it off with a layer of SV just to be safe. This whole collection has a mysterious, dark feel to it. Especially over black. My blogging bestie Courtney from Polished Lifting layered one coat over black, and it gives them a whole different feel. 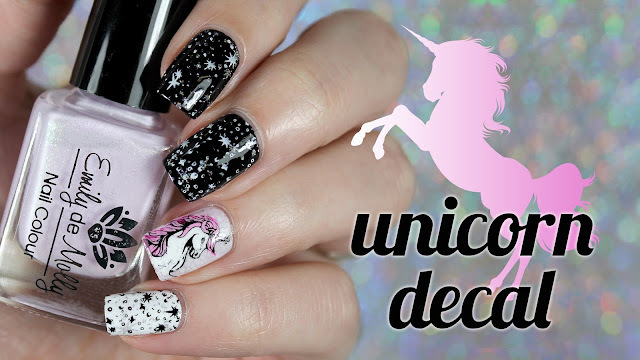 You should go check her out, she has such drool-worthy nails. The Dreamscape Part II collection is available right now, though the Baroness is on vacation until January 4, 2016. If you had to pick just one, which would you choose? I think, for me, it would be Etheric. you are so right. She has such an usual eye...and I love it. I thank my lucky stars that she chose me. I am so excited to see what 2016 will bring for Baroness X. These are all gorgeous. I feel like she's the brand to watch this year. for sure. If 2015 is any indication, this year is gonna be fab. Gah, they're so pretty! 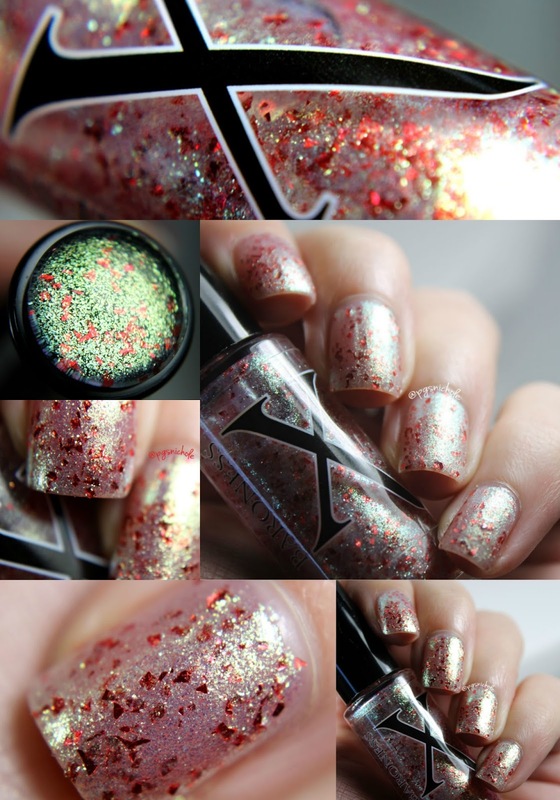 I don't usually like shimmers but these are incredible! Phantasmic is seriously so beautiful. 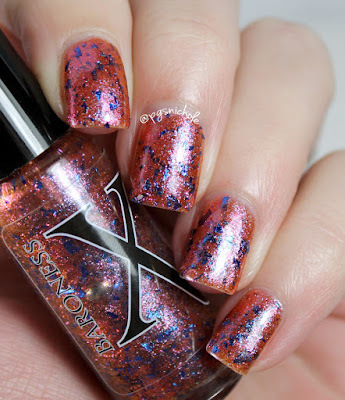 Baroness X makes such awesome polishes! I adore that she does the little thing on the top of the bottle. It's so helpful! That's some intriguing color combinations! The combination of the fine pearly shimmer and the flakes is amazing! I would definitely have to chose Etheric. Baroness X really knows how to make some interesting combinations, love it.